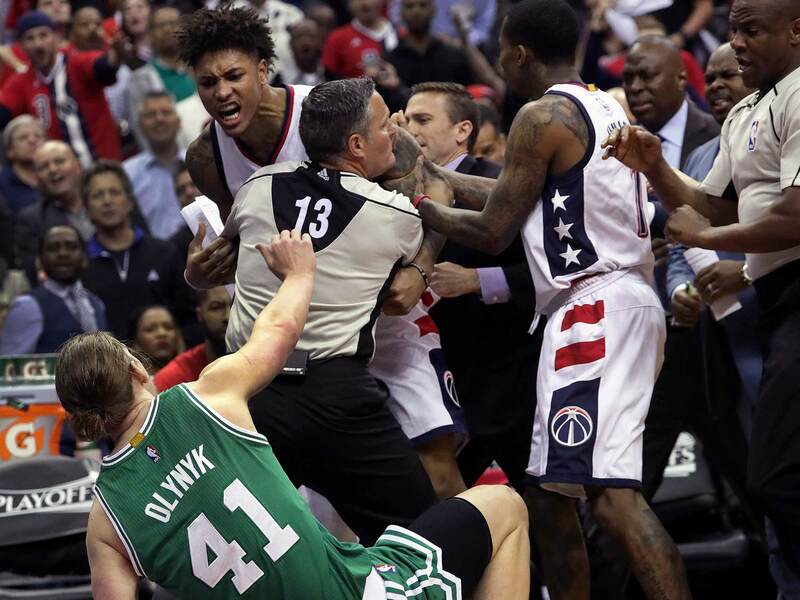 The Wizards crushed the Celtics in Game 3 to get back into the series, but Kelly Oubre's shove of Kelly Olynyk is all anyone wants to talk about. Here are six theories about what happened. In the Verizon Center on Thursday night, for about 90 seconds, nobody had any idea what happened. Did Kelly Oubre try to bodycheck a ref? Why was Kelly Olynyk on the ground? Was this the sequel to the boop? Were half of both teams about to get suspended? Sitting about 20 rows behind the baseline where it happened, I couldn't tell. Thankfully, a brawl was avoided. Refs separated Olynyk and Oubre and diffused the situation before tensions escalated. A suspension for Oubre is likely, but no one else appears to be at risk. 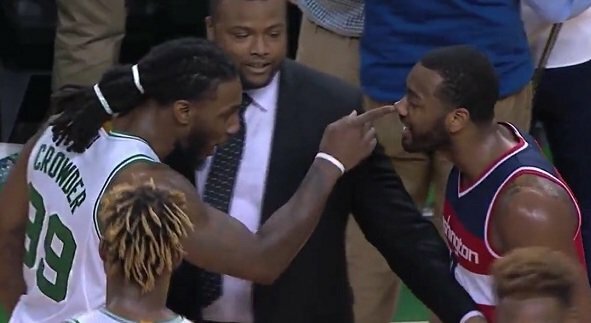 It was, however, one more chapter in a Wizards-Celtics rivalry that's only getting chippier as the season goes. So let's talk about it. I'm a lifelong Wizards supporter, which means I'm approaching this from a place of moderate-to-extreme bias. But that'll probably be true for half the people who discuss the Kelly Oubre incident on Friday. Everyone will have takes. In that spirit, here are six takes. Take #1: This was idiotic. In any objective sense, obviously, Oubre overreacted. Olynyk set a hard screen and he made contact with Oubre's head or neck, but it was a fairly typical basketball play. Then Oubre jolted up from the floor like a man possessed. It looked like an out of body experience. He was completely oblivious to the ref standing between him and Olynyk, not to mention the game going on around them. He sprinted full speed into a shove, nearly body-checked a referee in the process, and he did all this with his team up 20 points in a crucial playoff game. It was crazy. It was completely unnecessary. It puts his status in doubt for the rest of the series, and it's the sort of play that makes him and the Wizards look like amateurs. Smart NBA players don't do what Kelly Oubre did Thursday. Take #2: This was great and necessary. While everything in the section above is objectively true, this take is closer to how I actually feel. The Oubre response was completely irresponsible and I'll love him forever for it. Look, the Celtics spent the first two games of this series—and the better part of the last two years—shoving and elbowing their way through every defensive possession. They push the boundaries, they dare refs to blow the whistle, and they infuriate every opponent in the meantime. You could see it with Kelly Olynyk and Kevin Love two years ago, you could see it with Al Horford and Markieff Morris in Game 1, you could see it with Jae Crowder and Robin Lopez two weeks ago, and as a general rule, you can always see it with Marcus Smart. It's not necessarily a criticism, but it's kind of a fact: this team thrives by exploiting the gray area of the rulebook. If you were playing pickup against the Celtics, you'd loathe them almost instantly. So: Was Oubre smart to react that way? Definitely not. But was it cathartic to see someone finally snap and try to level someone on the Celtics? A thousand times yes. And had Boston earned this reaction? Of course. Don't make me go back to the boop for proof. Five Boston police officers standing between Celtics and Wizards locker room after teams were barking at each other after buzzer. Take #3: All sports are idiotic, but that's why they're great. The crowd loved every second of the Oubre altercation. When it was over, the energy was turned up to 11 the rest of the game. It's fine to think this was all stupid; but if we're going to play the maturity card, let's also acknowledge that all sports are stupid. Nobody got hurt here, and everything got more interesting. Kelly Oubre body-checking Kelly Olynyk is why the playoffs are great. Take #4: The Celtics had nothing to do with this. After the game, Al Horford was asked about the altercation involving the two Kellys, and he corrected the reporter. "There’s no such thing as the 'two Kellys,'" Horford said from the podium. "Kelly Olynyk stayed back. Oubre just came at him." Meanwhile, Isaiah Thomas was similarly puzzled at the podium. "I don't know why he reacted like that," Thomas said. "Especially to Kelly. Kelly's not trying to make anybody mad." This is the only perspective that's unacceptable. Come on. It's one thing to say Oubre overreacted, but to act like he was completely unprovoked? Olynyk hit him with a forearm shiver to the neck. As Scott Brooks said afterward, "I think we've got to control our emotion. We can't respond that way. But when you get hit in the head a few times—I mean, we're very competitive guys out there. We have two teams, very competitive. If you keep getting hit in the head, you might respond that way." Take #5: The Oubre incident had nothing to do with the game. There will be plenty who downplay this incident entirely, and that makes sense. It had very little bearing on a game that the Wizards dominated throughout, and it has very little bearing on a series in which the Celtics remain very much in control at 2–1. There's a good chance that all of this will be meaningless in a week. In Game 3, the two biggest factors were Isaiah Thomas and Otto Porter. The former looked mortal for the first time in about two weeks. The Wizards trapped Thomas more than they had in either of the first two games, and they also threw Otto Porter on him to try to bother him with length. Whether it was the defense or inevitable regression after playing basketball that was essentially perfect Tuesday night, Thomas struggled. And his struggles were a reminder of just how ordinary the Celtics can look without Isaiah supercharging everything. In that way, even the loss was a testament to how great he's been all year. Take #6: The Oubre incident explains everything in this series. If you'd like a recap of the Celtics-Wizards series thus far, video is below. The Olynyk screen was the first two games, and Oubre's response was Game 3. Afterward, Isaiah Thomas was asked about the dynamics at play with these two teams. "We don’t like them and they don’t like us," he said. "That’s just what it is." Twenty minutes later, John Wall added his assessment: "Just two teams that really don't like each other."